Our first port while on the Carnival Conquest was scheduled for Ocho Rios Jamaica. 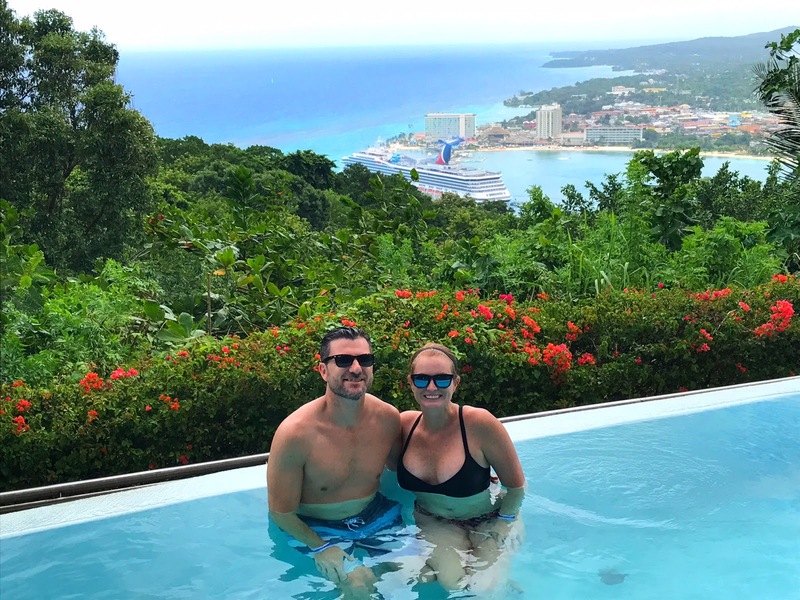 Flashing back to January, while on Carnival Vista, I was scheduled to visit Ocho Rios and go horseback riding in the ocean then climb Dunne's River Falls. Well thanks to the weather, I never got to step foot in Jamaica. 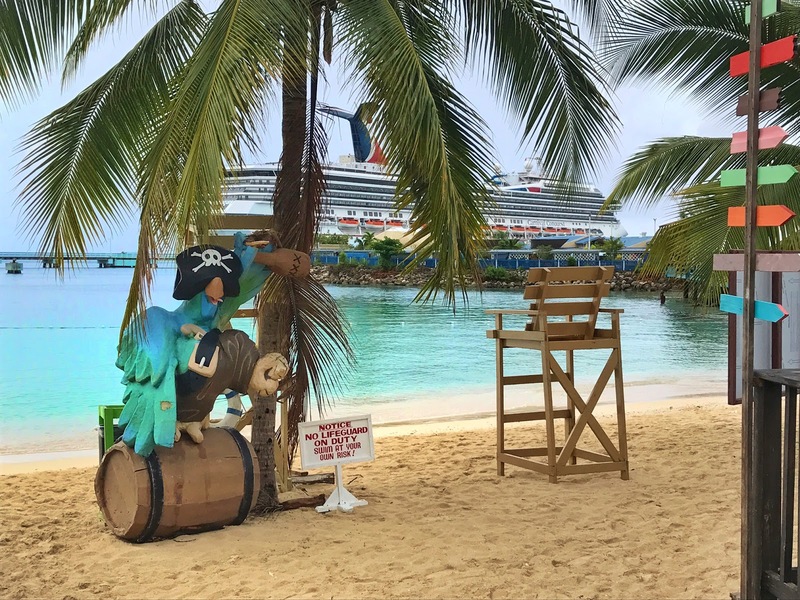 When we booked the Carnival Conquest and I saw Ocho Rios was the first stop, I got very excited. Although part of me was apprehensive as I already went through one Jamaica heartbreak. Plus my husband said 110% no to Dunne's River and I had no clue what we were going to do and made the decision the night before. 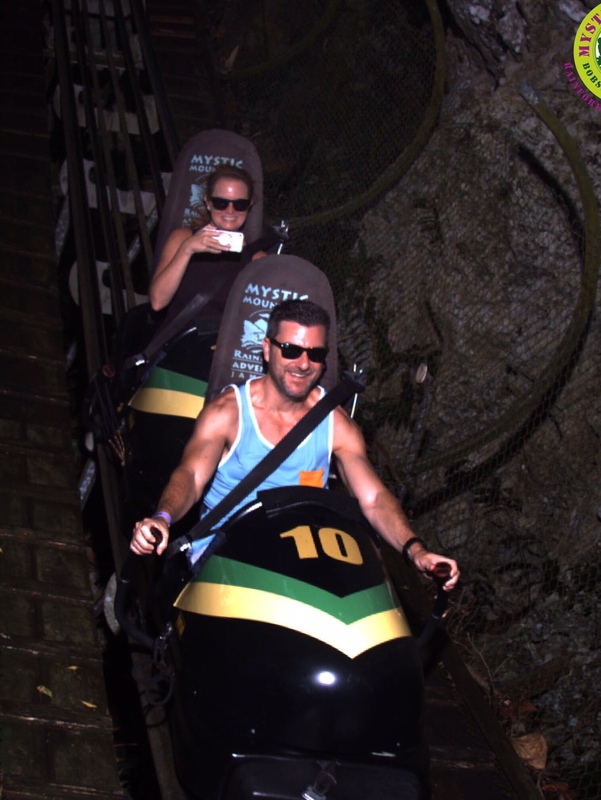 We booked our excursion while on board and decided upon Mystic Mountain Jamaica Bobsled Experience which included round trip transportation and a ride up (and back down) the mountain on the Sky Explorer lift. Note: As you see b y my husbands ankle above, they sell mosquito anklets for $10. You can get these at the dollar store in the US. Grab some before you go on any cruise, this will save you money! 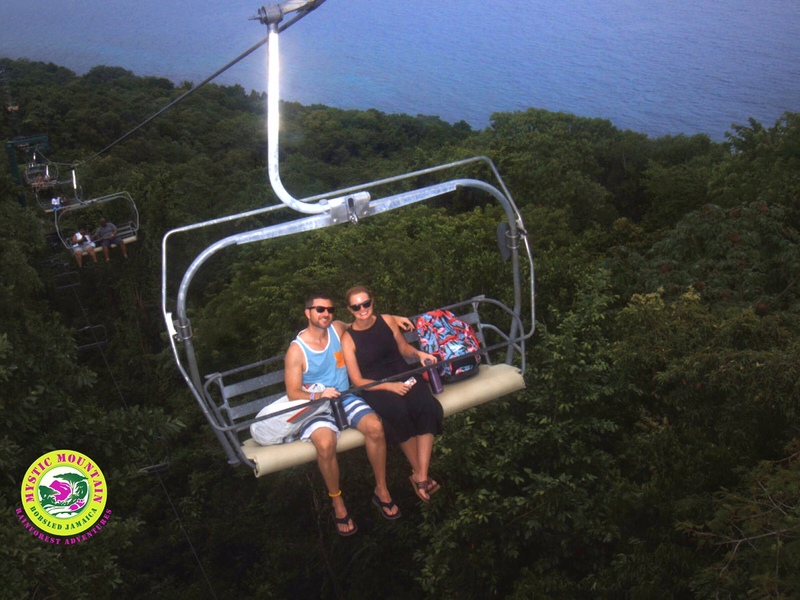 The Sky Explorer takes you 700 feet above the Jamaican rain forest. It was beautiful, giving us views of Ocho Rios you couldn't get otherwise. The description stated we could also see nearby Dunn's River Falls from up above but we somehow missed that. We did see some small waterfalls before going up the sky lift though!! Once up the mountain, we stood in a non moving line for quite a bit waiting on the Bobsled. 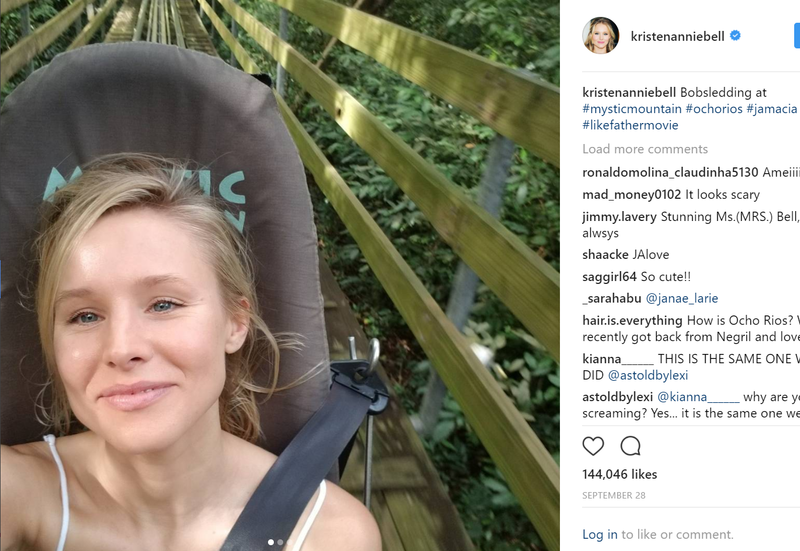 I found out later on that Kristen Bell was there the same riding the Bobsled! She was in Ocho Rios filming the upcoming Netflix Movie, Like Father. I'm assuming that was the reason for the delay because once the line started moving, we quickly got through the wait. I'm sure everyone knows the story of the famous Jamaica bobsled Olympic team - which inspired the movie Cool Runnings. Well that is pretty much what we experienced. A high-tech sled going down a 1000-meter long track installed into the side of the mountain. And gravity is your driver! After you go down the mountain, you are brought back up the mountain on an elevated tramway. You go down the mountain over 3,000 feet - pretty cool system they have to bring you back up! You can purchase photos and souvenirs when you get off the bobsled. We decided to purchase a photo and go have lunch. We had lunch on top of the mountain - a chicken curry wrap, while enjoying stunning views. Although the day was a bit gloomy, we still were blessed with some gorgeous sights. After lunch, we took a dip in the infinity pool and went down the water slide. All of these amenities were included with the chair lift. Overall, we were both very pleased with our excursion. As I mentioned above, if we were to do it again, no Bobsled. It reminded us too much of Disney's Space Mountain (with an amazing view). We took the sky lift back down the mountain and it poured on us. We luckily had a carnival towel on hand - those are great ponchos FYI! We didn't get wet at all. 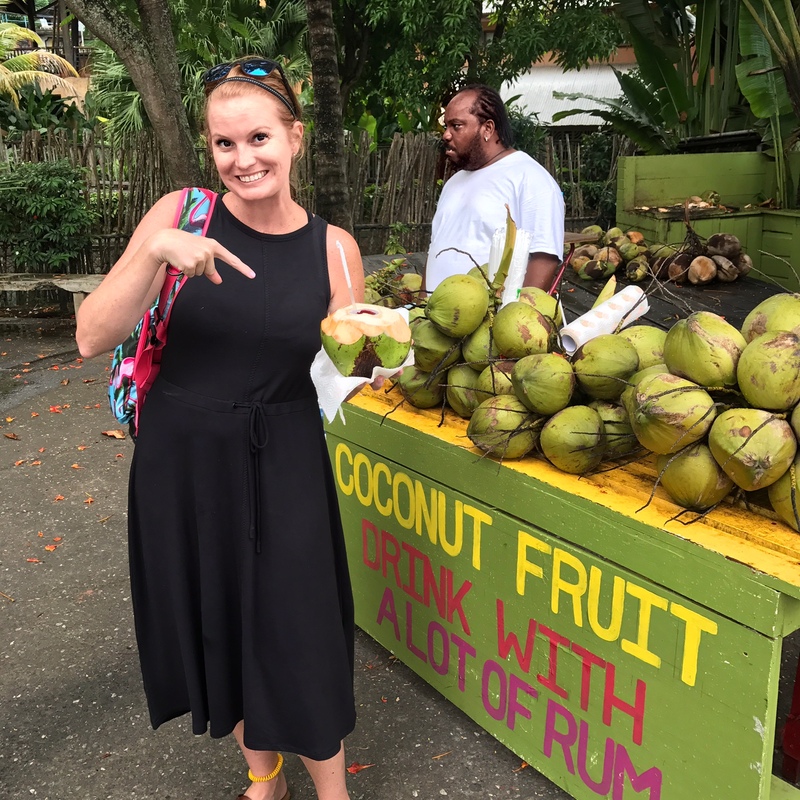 We had two stops to make before heading back to the ship - I wanted a coconut rum drink. This one was not near as good as the ones we got in Belize and it was a waste of $10. Then we went to Margaritaville because it was raining and I wanted a margarita and nachos. Although both the food and drink were good, we spent $60 after tip. We should've just gotten back on the ship and made Nacho's at Blue Iguana Cantina!! Oh well, both stops made for a good photo. If I find myself in Jamaica again, I would likely do a beach experience. From the views we witnessed, Jamaica is beautiful and there is more to explore.